To create a campaign, click the Create button on the Campaigns page. Campaigns. On the left of the page set the basic parameters of the campaign. In the right corner you can also choose to color of the name of your campaign.. Select the group to which you will relate your campaign to. It’s convenient to group campaigns by verticals, countries, type of traffic. You can create a new group of campaigns by selecting the Add new item in the group list. Then set the new group name in the field below. Once saved, the new group will be created with your campaign inside it. Select the traffic source. You have to add it in advance and set it in the Traffic Sources field. Use this field to specify the cost per click at which you buy the traffic. CPC - cost per click, CPM - cost per 1000 clicks, CPA - the cost of the click will be assigned with conversion. If the network passes the value automatically, choose Auto option. You can learn more details about cost tracking in this article. This is used to hide your landing page from the offer network. If you don't use the special scripts for the referrer substitution, we recommend you choose the Meta Refresh item. Read more here..
You can disable the detection of the device, geo, ISP, etc, if your campaigns don’t need to be optimized for these parameters. The detect disable reduces the redirect speed. It’s not relevant on the fast dedicated servers with SSD disks, because it reduces the redirect time from about 20-30ms to 10ms, but on a slow VPS it can be useful. Without detection of the country, operator and device, the tracker handles the click in 5-10ms. Also, it reduces the load on the server. However, be careful, the rules for parameters with a disable detect will not work. This item will be visible, if you add additional domains in the Domains field. In this case, you can choose the domain of the campaign. Yhe campaign URL will be generated on it, and the URL with the main domain will work too. 3) Fix On - fixing user for a certain path/landing/offer. Campaign URL is a link where you should send your traffic; it’s generated after saving the campaign. It contains all tokens configured for the traffic source. To open it click Advanced settings. The percentage of traffic loss for this campaign from the source. When working with a source a certain percentage of traffic is lost on the way to the tracker. The cross-country loss percentage can vary significantly. You have the ability to customize the percentage of losses in the source as well as individually for each campaign. By default, percentage in this field is set to the same value as in the source settings. Leads approval (Expect Approve) - the expected confirmation rate. This is set at 100% by default but you are able change it. Used in E-commerce scheme. You can disable the detect of the device, geo, ISP, e.g. if your campaigns don’t need to be optimized in these parameters. The detect disable reduces the redirect speed. It’s not relevant on the fast dedicated servers with the SSD disk, because it reduces the redirect time from about 20-30ms to 10ms, but on a slow VPS it can be useful. Without detect of the country, operator and device, the tracker handles the click for 5-10ms. Also, it reduces the load on the server. However, be careful, the rules for parameters with a disable detect will not work. The individual Postback URL for sending conversions to the traffic source or any additional services. In order to use it, just add the link to Advanced settings of your campaign. By default, works the Postback for the traffic source, if it is configured. Adds the specified parameters to all campaign landings. All tokens are available. Adds the specified parameters to the Campaign URL. Allows you to change or specify your campaign key. For links customization, please see this article. Code for the landing page. You can send traffic directly to the landing page, avoiding the tracker. Read more in this article. Next, you must choose the traffic path. 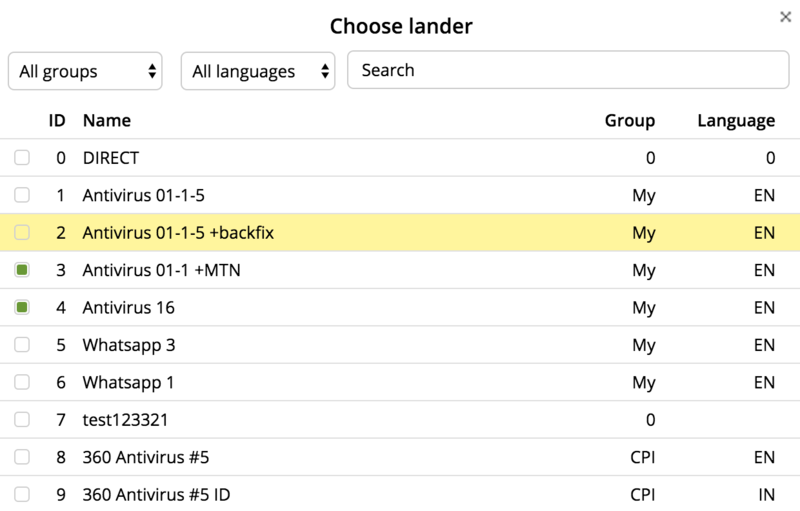 Click on Landing page to choose the lander in a new window. You will be able to find it quickly due to the system of groups and search. Just click on the desired one. If you want to work with a direct link to the offer, just click on Direct. To select an offer, the steps are similar to selecting a lander. Click on Offer and select it in the window. If you want to send traffic to an URL, click Direct URL. To any other campaign – click Campaign, and the same window of campaign selection will open. When sending clicks to another campaign, all the relevant tokens are passed to it. 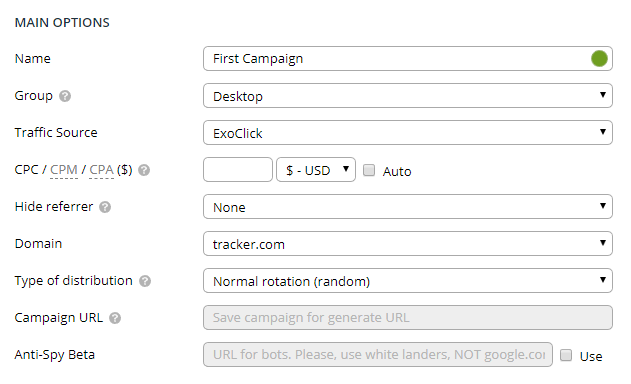 Also, on the campaign creation page, you can add a new lander or offer. To do this, click the New Lander or New Offer button. You can add multiple paths in your campaign. Just click on Add Path. More details about the traffic distribution are written in the corresponding knowledge base articles. 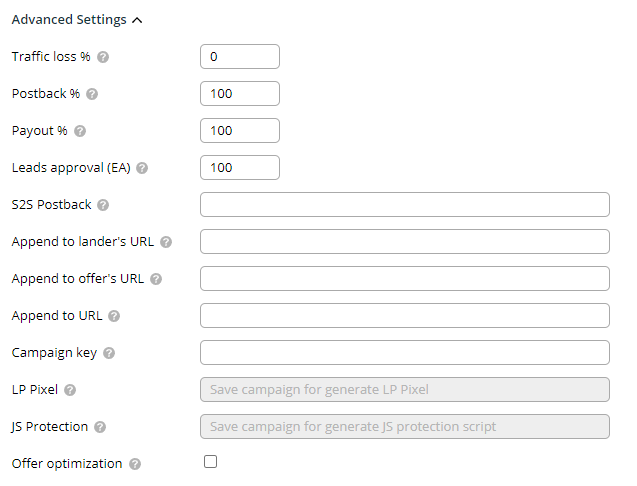 Once you set all values, press the Save button in the top of the page to save the campaign.